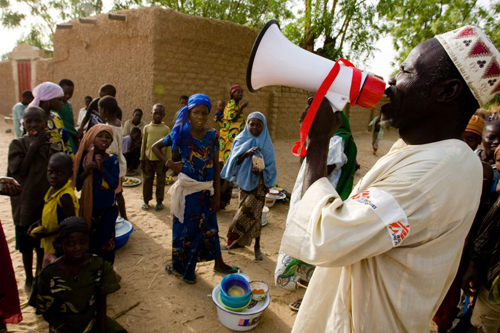 A town crier walks through Gangara, in Maradi Region, announcing the meningitis vaccination campaign. More than 1,900 people affected by meningitis have died since January in the “meningitis belt” of sub-Saharan Africa, which stretches from Senegal in the west to Ethiopia in the east. 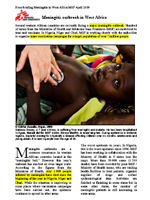 In Nigeria, Niger, and Chad alone, more than 56,000 cases of meningitis have been recorded in the areas where Doctors Without Borders/Médecins Sans Frontières (MSF) medical teams, working alongside Ministry of Health staff, are treating sick patents. They are also vaccinating more than seven million people, making this the largest vaccination MSF has ever carried out. Currently, dozens of MSF teams together with health authorities are performing vaccination campaigns throughout these countries to reduce the impact of the epidemic. Meanwhile, other MSF teams are travelling to urban and remote health centers to collect data, review and treat patients, and donate medicines. A child is vaccinated for meninigitis in Safin Raffi, Maradi Region. 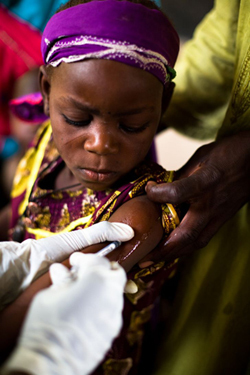 The meningitis epidemic currently affecting the north of Nigeria is reported to be the country’s worst since 1996. MSF teams, in close collaboration with the Ministry of Health, have been working to contain the epidemic in nine states: Bauchi, Jigawa, Katsina, Gombe, Kaduna, Sokoto, Kebbi, Niger and Zamfara. Activities have closed in Gombe and are soon to finish in Kaduna and Niger States. Teams have already vaccinated nearly three million people. The plan over the coming weeks is to vaccinate approximately 1.6 million more, meaning that approximately 4.6 million people will be vaccinated during the course of the campaign. People wait to get vaccinated in Gangara, Maradi Region. In Niger, MSF teams are working with the Ministry of Health to treat meningitis patients and are vaccinating in the southern regions of Dosso, Maradi and Zinder. 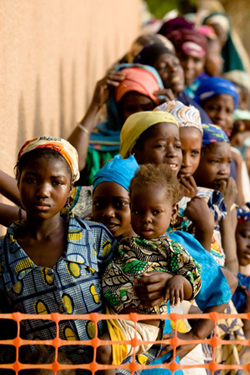 About 2.5 million people have been vaccinated so far in Niger and the teams plan to vaccinate 100,000 more. In the capital, Niamey, an MSF medical team is also treating patients and additional staff have been sent to assist. A total of 6,465 meningitis cases and 288 deaths have been registered in these areas of the country so far, according to the health ministry. Chad has also been hit by meningitis outbreaks. According to the Ministry of Health, 114 people have died out of 1,000 cases reported across the country. MSF teams have started vaccinating in Dourbali, in the southern regions, and will then continue in Goundi and Pala. The total target population is estimated at more than 120,000. Meningococcal meningitis is a contagious and potentially fatal bacterial infection of the brain membrane. The bacteria are transmitted through respiratory droplets or throat secretions, with spread commonly occurring through close contact. On average, meningitis kills half of infected people if they are not treated, and one out of 10 who are treated. Some 187 international staff and 7,500 locally recruited staff have been involved in vaccination campaigns and treatment of meningitis patients in Nigeria, Niger and Chad.